Imagine a place. . .
…that respects the unique gift that each child has to offer to the world. Our programs offer individual direction to guide and nurture each child’s spiritual, emotional, and intellectual gifts in fulfillment of the seed planted deep within by God. where the beautiful balance of freedom and responsibility is explored and developed. In a Montessori program, children develop a lifelong passion for learning and the confidence to excel at whatever they do. Many of the brightest minds and entrepreneurs of our century are Montessori educated; their creativity and connection with their inner drive was fostered in their most formative years. 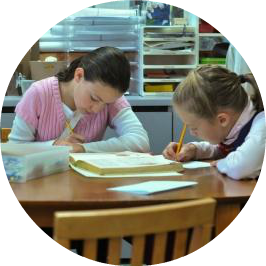 A Montessori child is empowered to reach their full potential for a brighter future. At John XXIIIMCC, our thoughtfully prepared environments coupled with our trained and experienced adults guide and nurture your child to grow in fulfillment of the seed planted by God deep within at his/her making. Your child’s gifts are cultivated in connection with his or her “Inner Guide.” This inner connection, once established, will bless, inform and sustain your child for a lifetime. If you value this touchstone experience for your child, then John XXIII Montessori Children’s Center may be just the place for your family to find a home. 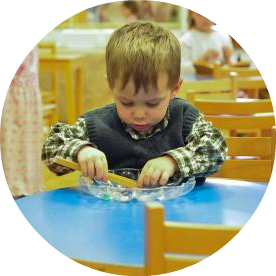 For further information, please see our Resources page, The Features and Benefits of a Montessori Environment and Social and Emotional Intelligence.